Posted on Monday, October 22, 2018 Monday, October 15, 2018 by GaryPosted in Mash-UpTagged Crimson Fox, Dr Light (Kimiyo Hoshi), Elongated Man, Flash (Wally West), Green Lantern (Hal Jordan), Maya, Metamorpho, Power Girl, Tasmanian Devil, Thanos. I’ll definitely agree with you there, as “Breakdowns” seems to be a very spot on term for how things went downhill quickly for the JL titles once Giffen and DeMatteis left. Now yes, I did and still, enjoy the Jurgens LA for what it is was, but the previous creative team was clearly the better incarnation of the two by far. Yep – Jurgens taking over JLA worked for me, too, particularly the Destiny’s Hand storyline; that said, the wrap up to the mystery of who was the real Bloodwynd was a bit a a let-down. After that, it all got a little painful. 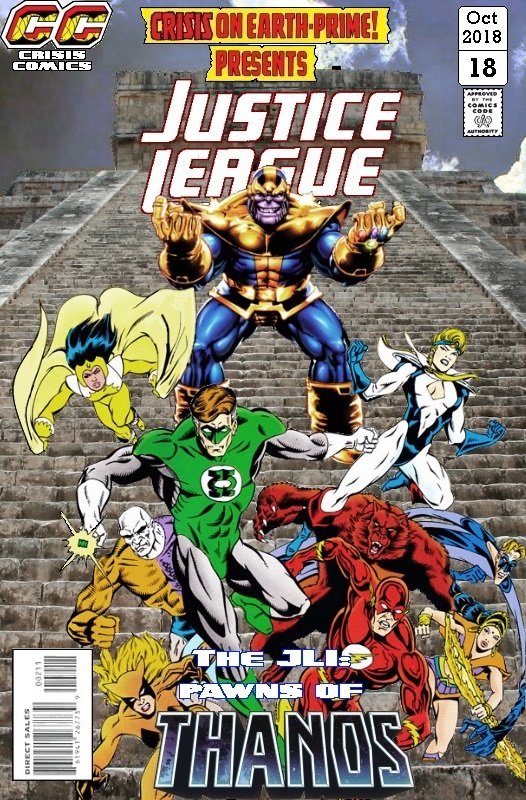 Europe/International went down in quality as well which disappointed me at the time – I was a fan of Gerard Jones’ Green Lantern work, but he just didn’t deliver with JLI/JLA. YES!!! That story arc is absolute favorite from Jurgens’ run. I guess mostly because you briefly get to see the original JLA (albeit the evil mirror, mirror versions) the return of the Atom and Ted coming back from his coma. I owned a couple issues here and there of Jones’ JLE run, but the stories and art just didn’t keep me interested. I don’t know if you remember the Sonar story that culminated in #50, but there are two character inconsistencies that I still remember to this day; one Hal and Kara make out while hiding out in Hal’s ring-generated forcefield and 2nd Hal brings up having dinner with Jay garrick at his house when he was younger. I still don’t get the point of either of those two instances, especially the last one since Jones never elaborated further on that. I took it to mean maybe some of the Pre-Crisis continuity was creeping into the Post-Crisis world, but nothing ever came of it. Do you? And yeah, that line about Jay made no sense; who knows if Jones ever planned to pick up on it? That’s my point, it never was, and yeah who knows of Jones was ever going to follow up on that line or not. Just seems weird if he didn’t to write such a throwaway, but odd line like that.